Palak Paneer is a timeless and classic Indian recipe. 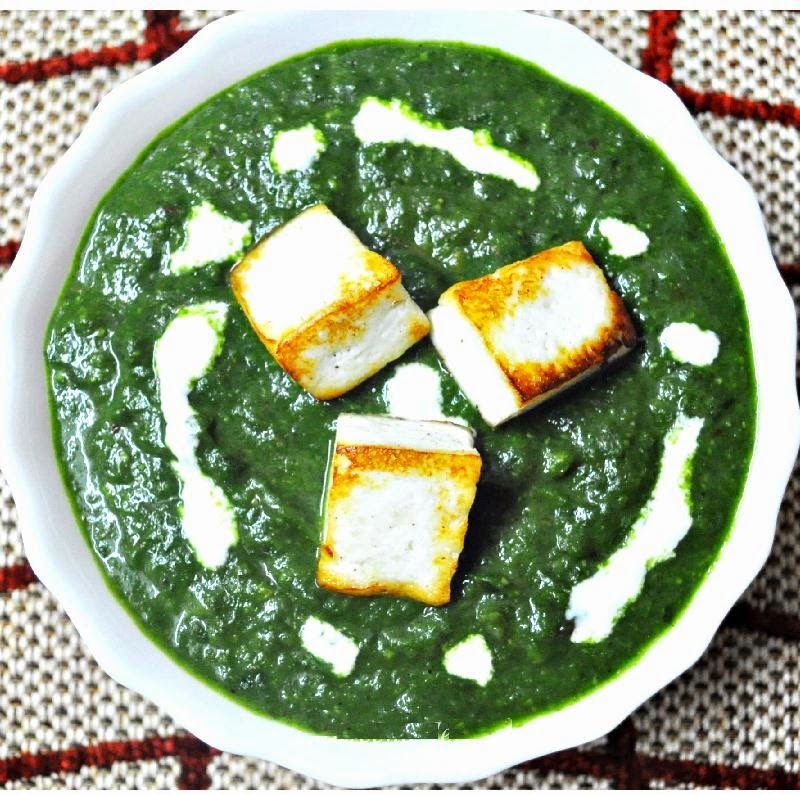 The very name conjures up images of succulent paneer cubes floating around in a rich spinach gravy. This recipe is timeless for me too as it's from my mother's recipe repository :) Without further ado, let's get started !!! Note : If using fresh spinach leaves, it's imperative to wash them well before use. Also it's recommended to always blanch the greens than pressure cook them, in order to retain maximum nutrients. 1. Wash and drain the spinach. If using equivalent amount of frozen spinach cubes, directly dissolve them in water. 2. Chop the onion and blend in a mixer along with ginger, green chillies and cinnamon. 3. Blanch and de-seed tomatoes. Drain the excess water and chop the tomatoes. Blend along with the spinach and turmeric powder to make a smooth puree. 4. Heat oil in a pan. Add the ground onion paste and fry for 5 to 7 minutes till the raw aroma leaves the mixture. 5. Meanwhile heat 1 tsp oil in a non-stick pan and lightly saute the paneer pieces till light golden. Immediately transfer to a saucepan full of boiling water. This will remove the excess oil from the paneer and also make it soft and absorbent. Let them soak for about 7 to 8 minutes, drain on a tissue paper. Alternatively, you can use the paneer cubes as is, i.e without frying, to suit your tastes. 6. To the onion gravy, add the spinach puree and cook for about 5 more minutes. Now drop in the paneer pieces gradually, stirring the gravy simultaneously. Cover cook for 4 to 5 more minutes. Remove and serve with any Indian bread or rice.